When I first started climbing, I thought buying a pair of rock climbing shoes is superfluous. Why should I buy climbing shoes when I have my tennis shoes. Tennis shoes should work as well, right? 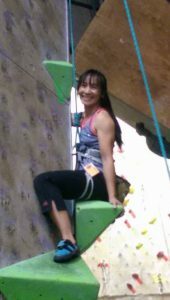 As I climbed more frequently indoor, I quickly learned that tennis shoes are fine on simple climbs such as grade 5.3 up to maybe 5.8 almost effectively but they do not work as well as climbing shoes because the rubber on tennis shoes slip off the rock wall. The climbing shoe rubber is especially designed to stick to the surface of the rock effectively. If I plan to climb more often, an investment in a pair of climbing shoes became much more important to me. Socks or without socks is definitely debatable if you are climbing just for fun and stay in shape. It depends on your liking and preferences. Some women started climbing with socks because they do not want their feet to be smelly while others like me started with no socks because my shoes are tight and with socks my feet do not fit as well. The socks can be super thin socks or even sock liners. Here is simple pair of Drymax Run Hyper Thin No Show Socks that I found on Amazon. Now if you are seriously considering to be a competitor in rock climbing, I would recommend to climb without socks. Then again, you can be an amazing rock climbing athlete climbing with socks. It all boils down to is your preference. What ever makes it comfortable and fun for you. Beginner climbing shoes are generally flat and the most comfortable fit for a long day of climbing. The price tag is also easier for your pocket book when comparing to the intermediate and advance shoes. The rubber for these shoes are thicker for good support and last longer than the softer rubber. They are great for climbing cracks and on long routes. These shoes are also forgiving when comes to the climbing foot work. When you are new to climbing, you are still learning how to place your feet effectively. I remember when I first started I dragged and smeared my feet along the wall unconsciously more than I placed them. Until I learned to move more deliberately, the dragging feet wears out my shoes much more quicker by leaving the rubber behind on every drag. This is great incentive to improve my climbing technique. Another positive aspect about these shoes is that they are not only for beginners, experienced climbers also use them for comfort and all day climbing on long routes. The most common climbing shoes among beginning climbers are the La Sportiva Unisex Tarantula. The price varies from $75 – $90 depending on the size and colors on Amazon. This was my son first pair of climbing shoes when he started. The intermediate to advance shoes have a pronounced arc shape, down turned toe, and edges. There is a point at the toe so that when you climb your weight is shifted toward the toe and the edges of the shoes. This allows precision and balance on small or thin holds. The arc shape also support heel hook for climbing roof and overhang sections. The rubber can be hard or soft depending on the brand. While the hard rubber gives comfort and support to your feet, the softer rubber allows more flexibility so you can hook your foot on to a hold with better control and precision especially on steep and overhanging walls. On the down side, the softer rubber does not last as long as the hard rubber. My foot work learning curve for climbing increased when I used the advanced shoes. There is very little room for sloppiness for my feet. I have to be precise on the placement of my toes and edges to take advantage of the shoes capability or I’ll slip right off the rock. It took me the first month to break in the new shoe feel and several more months to re-learn how to use my feet properly with the arc and the down turned toe. I definitely love them now!!! The shoe that I have is the La Sportiva Solution for Women. I only wear them while I climb and take them off between climbs. The average price is $180 on Amazon. These shoes do occasionally go on sale. I bought my at 20% discount. I seen a lot of women wear the La Sportiva Solution as well as children. The women shoes come with smaller size. There is also a similar version La Sportiva Solution for men. The lace up shoes fit most people and especially if you have broad feet like my husband. He loves his shoes which are lace up shoes – Scarpa Men’s Instinct. However, they are inconvenient to slip on and off when you are moving from climbing route to another. The price varies from $95 to $154 on Amazon. The velcro shoes are convenient to slip on and off. I definitely prefer the velcro fastening. I am a little lazy to lace in and out at every climb. Because my feet are narrow, it is easier to find a good fit in the velcro style. My husband has a harder time fitting in the velcro shoes because of his broad feet. Slippers are also called slip-on. They have an elastic closure systems with softer rubber and of course with the ease of slipping on and off. They generally stretches over time with being comfortable at first then less precise over a period of time. The slippers are comfortable shoes for long day of climbing and great for cracks. The price for a pair of Evolve Addict on Amazon is from $99 to $100. For climbing shoes, I wear one to a half size smaller than my natural shoe size depending on the brand. The climbing shoes generally comes in different format for the sizes such as European (EU), UK, USA (men), USA (lady). To give you a little bit of reference on the sizing, my La Sportiva Solution size is UK – 2½, EU – 35, USA (men) – 3½, and USA (lady) – 4½. My natural shoe size is 5 to 5½ depending on the brand of shoes. Similar to regular shoes, the sizes of climbing shoes also varies from brand to brand. I won a pair of climbing shoes at a climbing competition with the brand Red Chili Voltage. The competition was the old lady division, wahooo! I’ll take whatever I can get. Those shoes are definitely aggressive and advance climbing shoes. My size is UK – 3.0, US – 4.0, EU – 35.5 which is the smallest they have. They were slightly big but I think they still work fine. Women climbing shoes are generally lower around the ankle, slightly longer toe bed, smaller and narrower heel cup, and lower instep than men’s shoes. Also, the women climbing shoes run smaller in sizes as well as different fun colors. Regardless of the women or the men shoes, my heel still wants to slip out of the shoe while the toes in the front fit fine. I tighten the velcro fastener and I am good to go. There are many more shoes available out there in a unisex model. Women and men are not limited to the label for women or for men. Try them on for size to see what fits you best. When my son started, he was 11 so we bought him La Sportiva Unisex Tarantula. He worn it out within a year. The second and third year we went through at least 2 more pairs within six months because his feet grew a few extra inches within months. My son also wore out his rubber much quicker because he dragged his feet against the rocks unconsciously. So as rule of thumb for kids, buy for them about a size bigger than their feet since they are constantly growing until they hit their peak growth. Have them wear socks until they fill in their shoes. As my son skill level increases, he choose more aggressive shoes. He seems to like the velcro version of the Scarpa Instincts best. There are many aspects to consider when choosing climbing shoes. It is definitely a worth while investment if you plan to climb more often than once a month or several months. If you are looking to buy a pair of shoes, shop around and try them on first. Remember each brand is different from each other. You can buy the shoes at your climbing gym and support your local merchant or know the brand and size that fit you most and shop around online such as Amazon.com for climbing shoes . Until next article, climb on my friends.